AromaLIGHT is both innovative and connected. It easily allows you to personalize your mood lighting, and the diffusion of your essential oils or mood fragrances, directly from your smartphone or tablet. Using your telephone or tablet, program the light and diffusion of fragrance to turn themselves on progressively, waking you up in a pleasant manner. Simply remove the drawer (A) at the top of the light and put a few drops of essential oil or mood fragrance on the pad (1 extra drawer and 1 extra pad included). Download the free AwoX SmartCONTROL application (Bluetooth smart compatible). You can then control the colors and lighting level from a distance, as well as the diffusion of your essential oils or mood fragrance. You can even wake up thanks to this light! 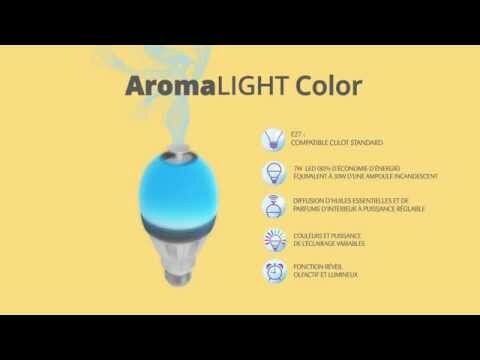 The AromaLIGHT is an essential oil diffuser and connected LED light that can be used instead of a standard light bulb!